Our horses roam around free on our property much of the time, but during business hours, when we could have customers coming for trail rides, they stay in tents! We’re pretty proud of our modular housing for horses. It fits the Florida climate perfectly. 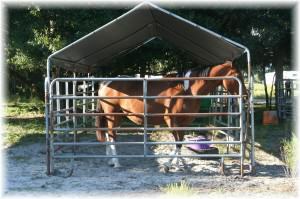 The horses’ pens are made of horse fencing panels. They are expensive, but sturdy and moveable. Most importantly, though, they’re not stuffy like a traditional wood barn would be. There is good airflow and ventilation….no danger of mold or fungus like with a regular wood barn. 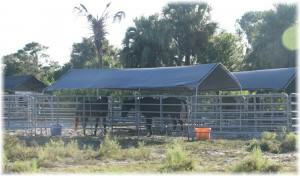 We picked an extra sandy spot for our horse pens…the horses stand in clean sand, not straw, stall mats or on concrete. The pens are open so they get a nice breeze and can also see their friends! The tarps that we use on the tents are silver colored and reflect the heat. With the breeze flowing through the panels and the tarps reflecting ability, it is actually nice and cool in the horses’ pens, even in the Florida summer heat. Most of the pens are 10×24. Some of our pens are back to back, but other horses have a pen all to themselves. Horses are extremely social animals, so we pay close attention to who hangs out with whom in their free time. Friends get put close to each other, so that they can enjoy each other’s company even when they are in their pens. When you see horses in back to back pens, it’s because they’re good buddies and like hanging out with each other. Normally, the geldings (boys) will want a stall buddy while the mares (ladies) want a pen to themselves! Phantom, Dillenger, Jazz and Blaze like to share…..
Our mares, Diamond and Eden need their personal space…..
Apache has a pen by himself because he’s half Clydesdale and he’s BIG! 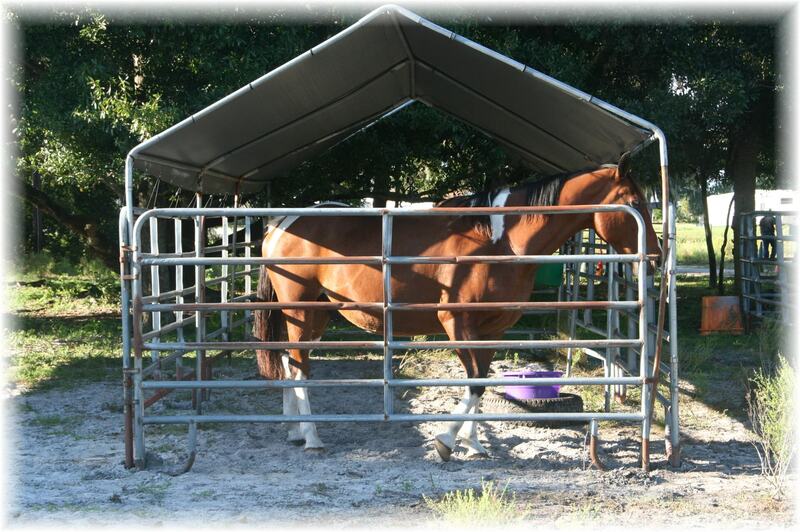 Round pens, arenas and quarantine areas are also quickly and easily constructed as needed. Whenever we get creative and want to reconfigure our setup, it can be done in a day. And last but not least….when there’s a hurricane or a tropical storm headed our way, we take down the tarps, so there will be no flying debris. In these situations, the horses have a natural instinct to wait out the storm in our woods… the safest possible situation during difficult times. We like tent city. It works for us. 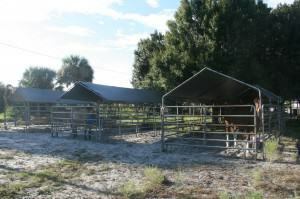 This entry was posted in Uncategorized and tagged Adventure Ride, beach horses, Florida Barn, Florida Trail Riding, Hillsborough County Trail Riding, Horse Rental, horseback riding outfit Bradenton, kid safe horse, Palomino horse, Unguided trail rides.